It’s crazy to think about, but those two weeks were the last stretch of time that Robert and I will have, just us, for a very long time. That time gave us the opportunity to spend our days doing productive things while also spending tons of time relaxing. We slept in, watched a whole bunch of movies (Magic in the Moonlight was my favorite), listened to hours of Pandora holiday music, binged on the first two seasons of The Americans (love! ), cooked delicious meals, ate bowls upon bowls of popcorn from our new Whirley Pop (highly recommend! ), downed daily plates of homemade Christmas cookies, and soaked in the holiday season by our Christmas tree. We also celebrated Christmas Eve and New Years Eve with wonderful friends. I tried to snap at least one photo per day to remember this precious time. You won’t see anything especially exciting here (or a stitch of makeup or anything except sweats). Yet it captures, for me, some of the most memorable moments of the past year, cone-headed dog and all. 12/22: Planning our Christmas Eve dinner. This was so fun! 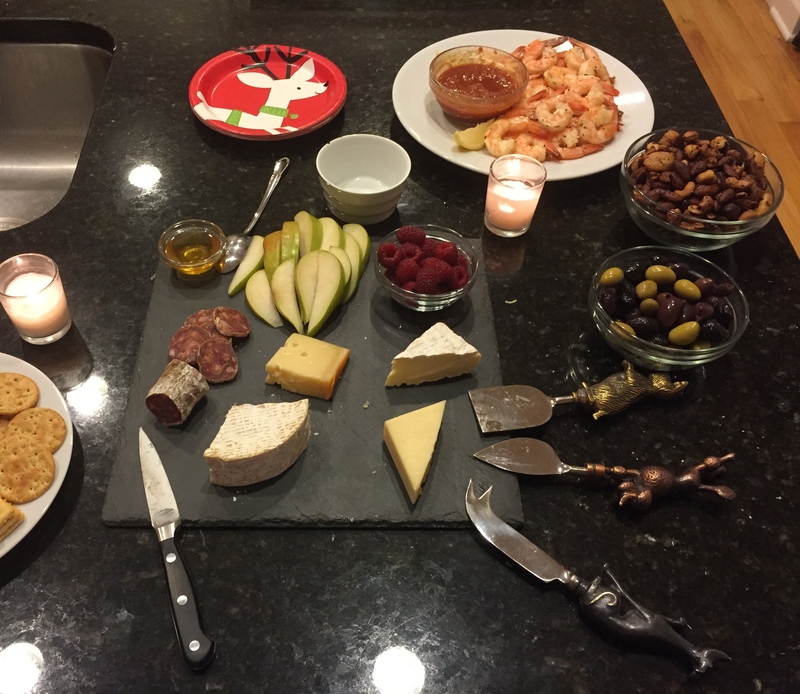 It’s the first time I ever cooked for Christmas and we wanted to go big. I’m so happy with how everything turned out. Everyone says you shouldn’t make a recipe for the first time when cooking for guests (our friends Erica and Zack were joining us from Christmas Eve). 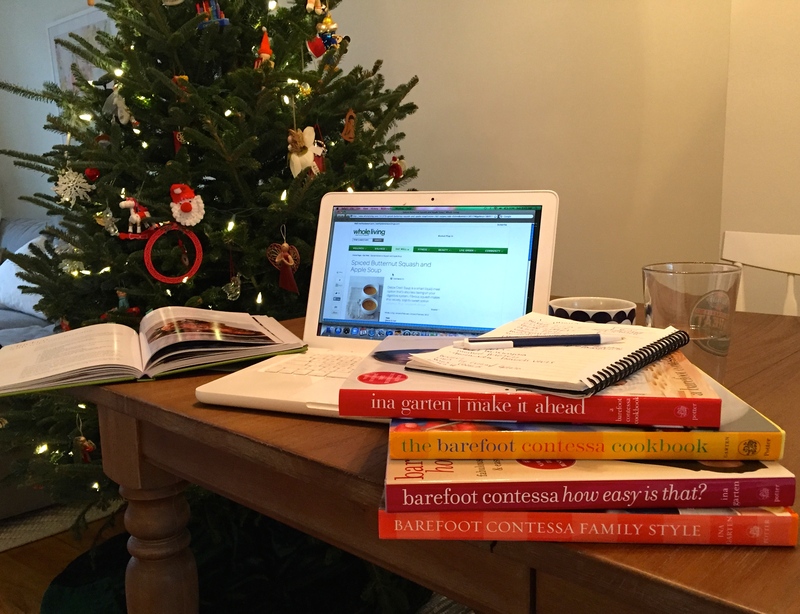 I don’t agree–as long as I follow a Barefoot Contessa recipe to the letter, even if it’s new to me, it’s always going to be great. Ina didn’t disappoint. 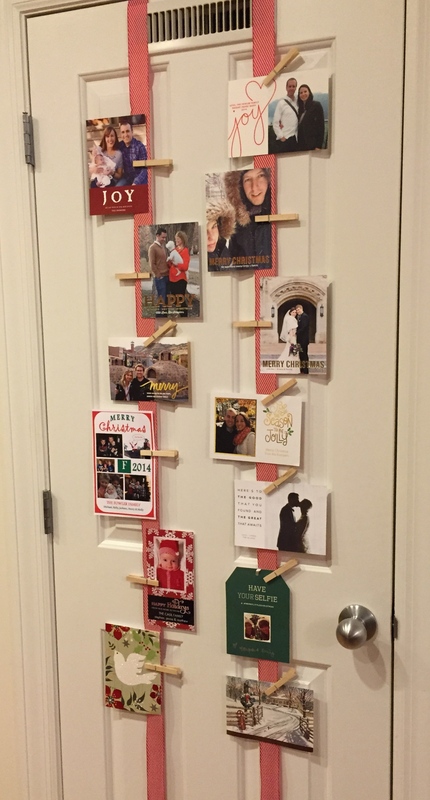 Robert made this beautiful display for our holiday cards. I loved walking by and seeing so many friends and family up there all season long. Hey look, that’s us at the top right! I went cookie crazy! 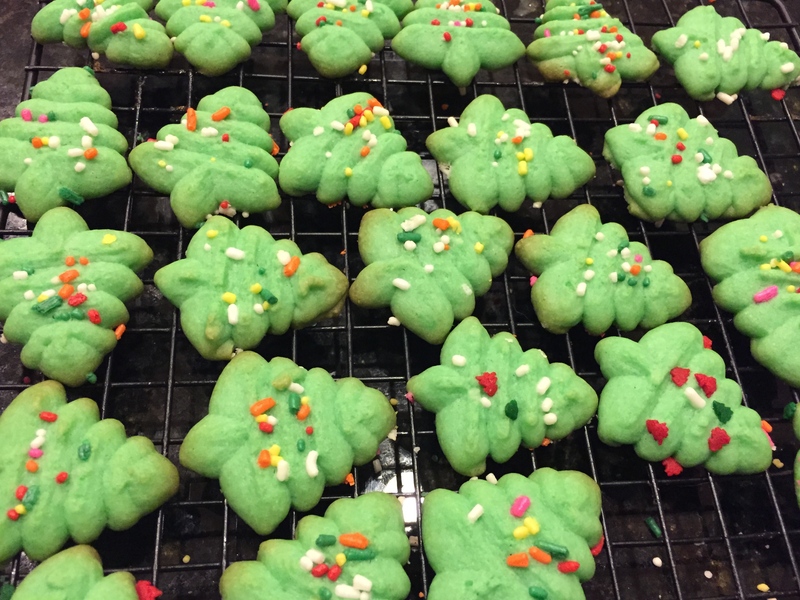 Over several days I made: these Christmas tree spritz cookies (a classic from my mom’s side of the family), peanut butter blossoms, chewy molasses crinkles, and frosted sugar cookies (Robert’s mom’s recipe). 12/23. Ooof, that morning. We’d just dropped Remy off for his surgery and had no idea what the future held. 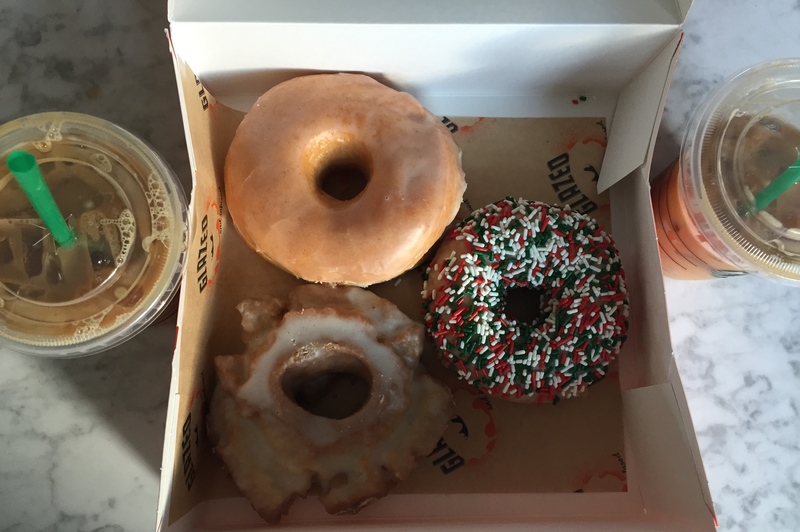 In a teary/numb/zombie-like state we made our way to Glazed and Infused for some good old-fashioned emotional eating. Happily, we got the call a few hours later that we’d be bringing our fluffanutter home. 12/24. Christmas Eve! We had the best day!! I woke up ridiculously early (like 4 a.m.) thanks to a little baby practicing his swim flips in my belly. So I did the only logical thing and started cooking. I made several more batches of cookies and began prepping for dinner. 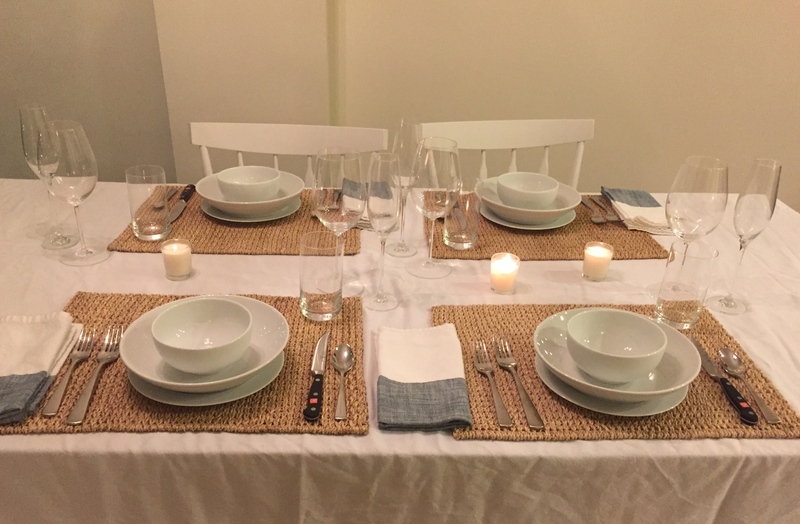 Before our friends arrived that evening, Robert set the table. Party time!! Appetizers included a cheese plate, olives, homemade spiced nuts, and Barefoot Contessa’s roasted shrimp cocktail and cocktail sauce. 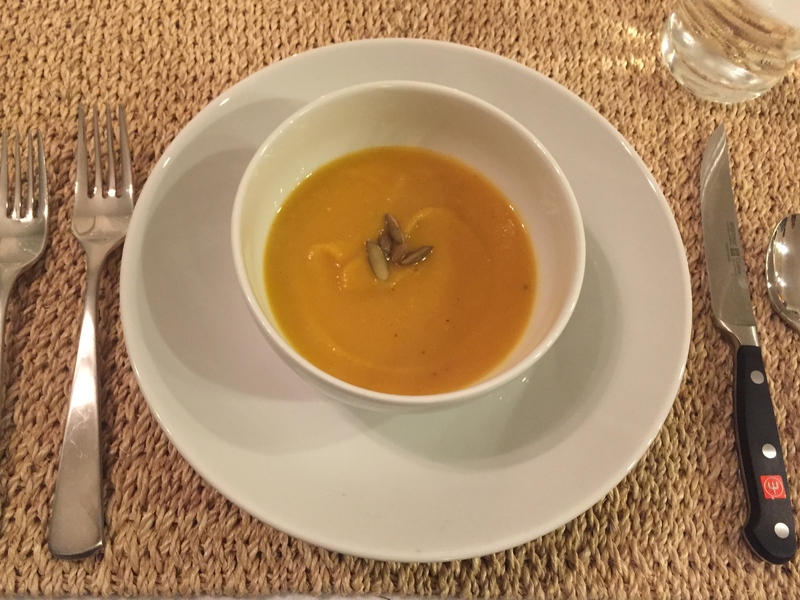 Next course: Apple and butternut squash soup. This recipe from Simply Recipes is SO good. The pinch of cayenne at the end really gives it a kick! Sweet and spicy is always a win. The next course, not pictured (oops), was a simple green salad with a Barefoot Contessa vinaigrette. Onto the main event. Barefoot Contessa’s Filet of Beef Bourguignon. Oh. My. Goodness. It’s the best thing I’ve ever made. Hands down. Game over. I served it with mashed potatoes and sautéed broccolini. We chased it all down with a plate of Christmas cookies. I’m just sad I didn’t get a photo of the four of us, but we had a great time. 12/25. Christmas Day!! Before Christmas, Robert and I never discussed whether we’d be getting each other gifts or not. Lately, we’ve focused more on experiences (like our anniversary trip) rather than material things. And we love that. 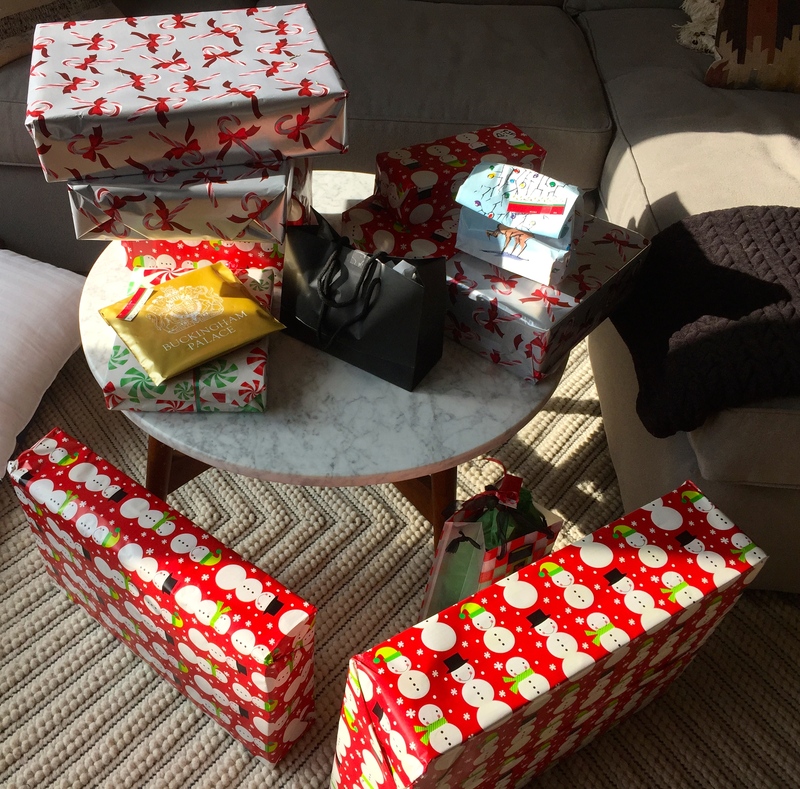 So it’s funny that we ended up giving each other a bunch of (thoughtful) material gifts this year. Also funny: We gave each other bathrobes! 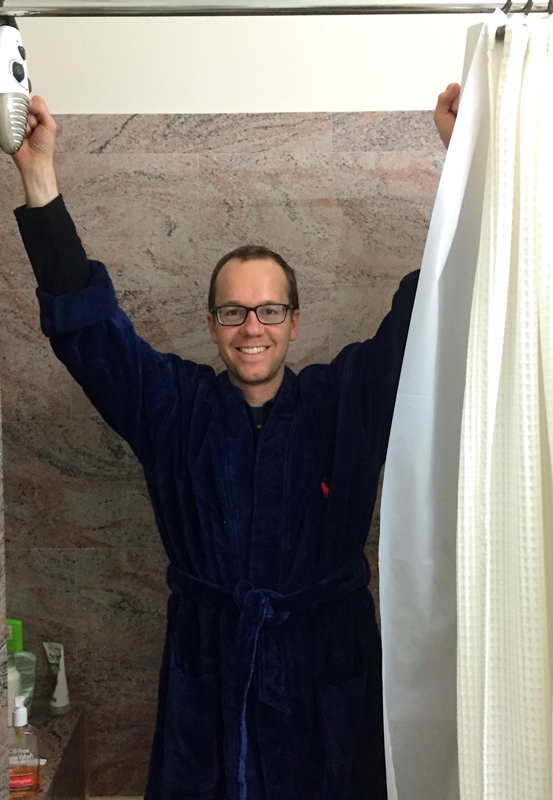 Here, Robert’s testing out his new robe with his new shower radio. The man loves his NPR. This pretty much sums up how we spent the rest of our Christmas Day: Watching movies, relaxing, and napping. I didn’t even cook anything because we had so many delicious leftovers from the night before. 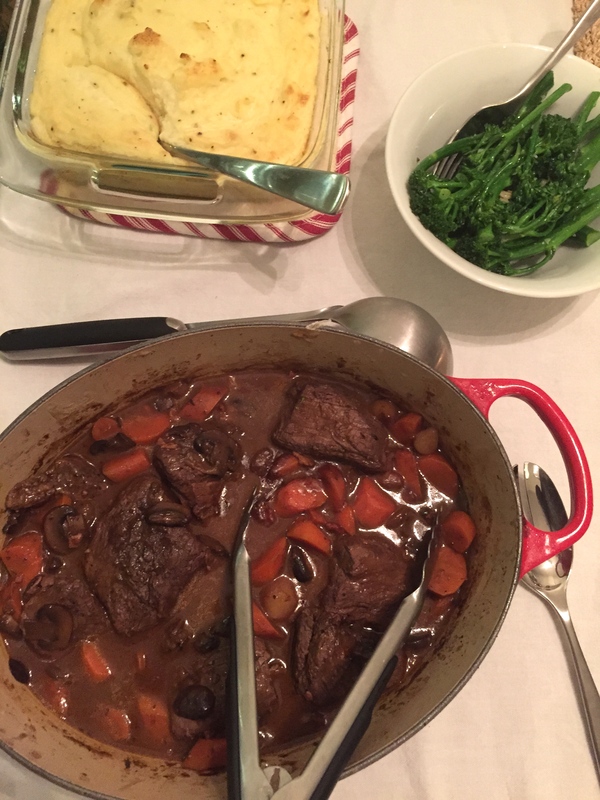 In case you were wondering, beef bourguignon only gets better with time. 12/26. We may be crazy, but we’re planning to cloth diaper our baby boy. 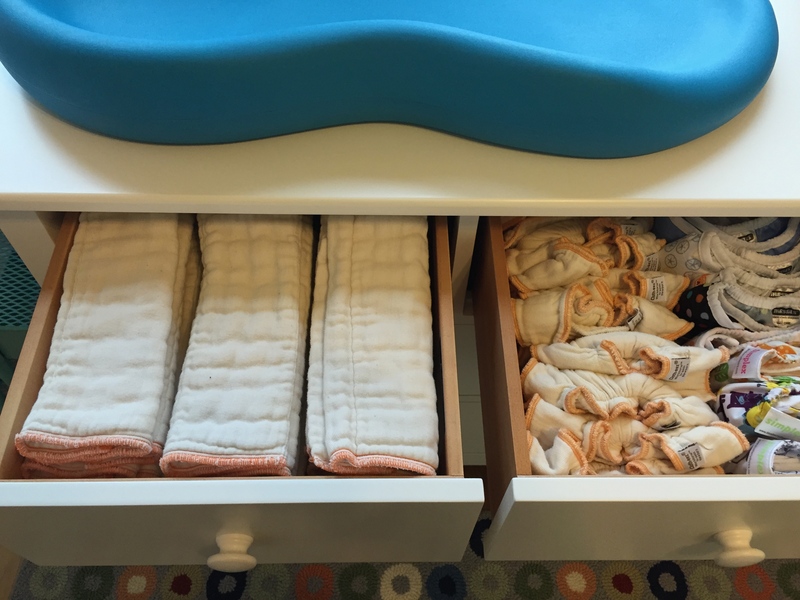 I may do a separate post about this (although do you really want to read about diapers on a blog that also has food?…) After LOTS of research it just feels like the right decision for us. 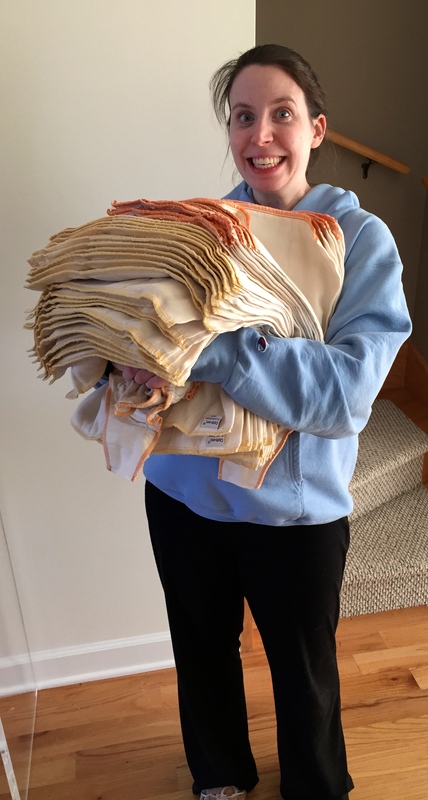 I had everything we’ll need for the first few months and I was excited to prep these prefolds and fitteds. Prepping involves four to five cycles in the washer and dryer in order to strip away the natural cotton oils and increase their absorbency. I’ve never been so excited to do laundry in my entire life, which may explain why I appear slightly possessed : ) The end result! I still stare at his drawers of dipes and covers daily. Also: nursery sneak peek! (Full tour coming eventually.) 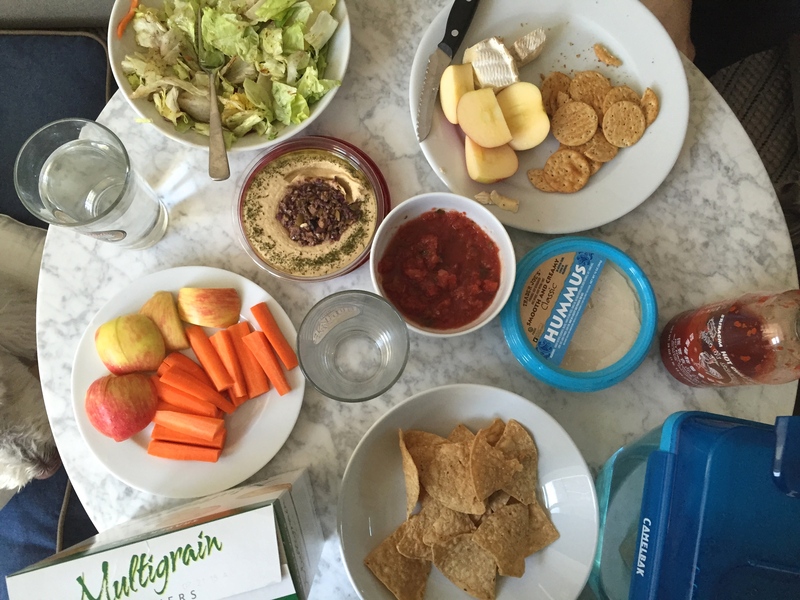 This spread is basically how we ate for those two weeks. So many snack lunches & dinners!! We had some real home cooked meals in there too, I promise. We didn’t eat a single meal outside of the house for more than a week. It was extremely gratifying. Also, I’m currently obsessed with romaine and iceberg lettuce salads. I know darker leaves are better, but I just can’t get enough of the crunch right now. New Years Eve! Once again, I’m sad I didn’t get a group picture. 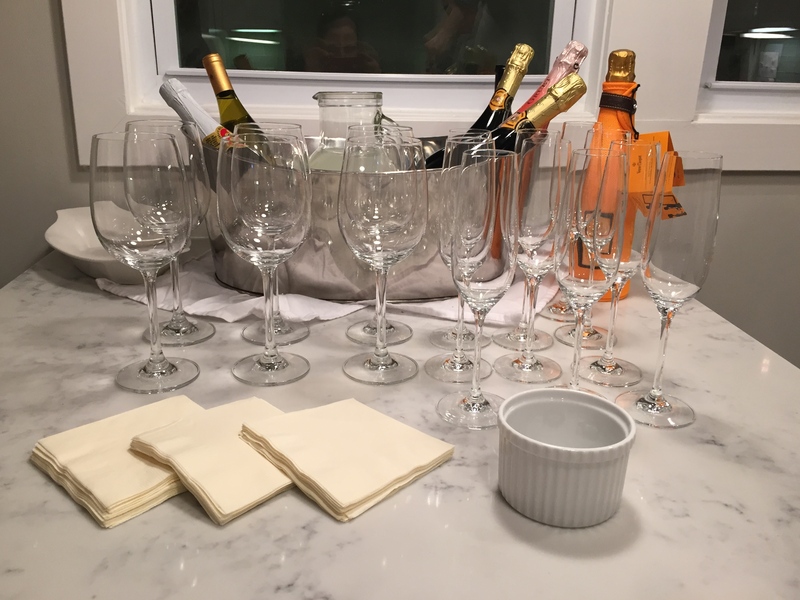 Our friends Lisa and Brian had a bunch of friends over to their home for NYE. They recently gutted and remodeled nearly the entire house (themselves!!!!) so it was a great way to break it in. Everything came out so beautifully! New Year, new house projects!! Over the holiday we got a freezer for our garage. 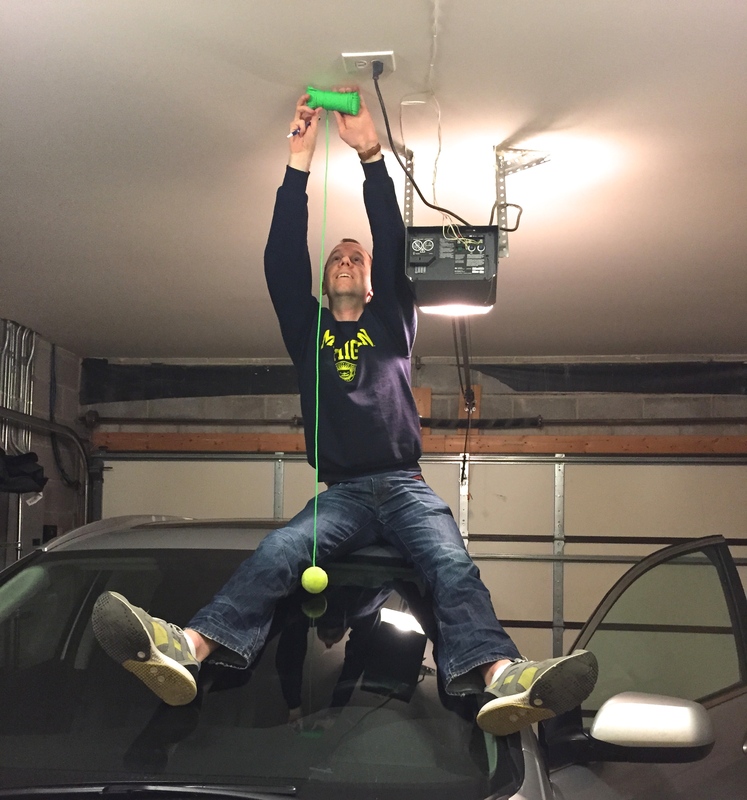 Robert hung a tennis ball from the garage ceiling so I won’t drive into the freezer. So far so good : ) Painting the baby’s bathroom!! I still can’t believe our baby has his own bathroom (?!??) The walls needed some patching and painting and Robert got ‘er done. 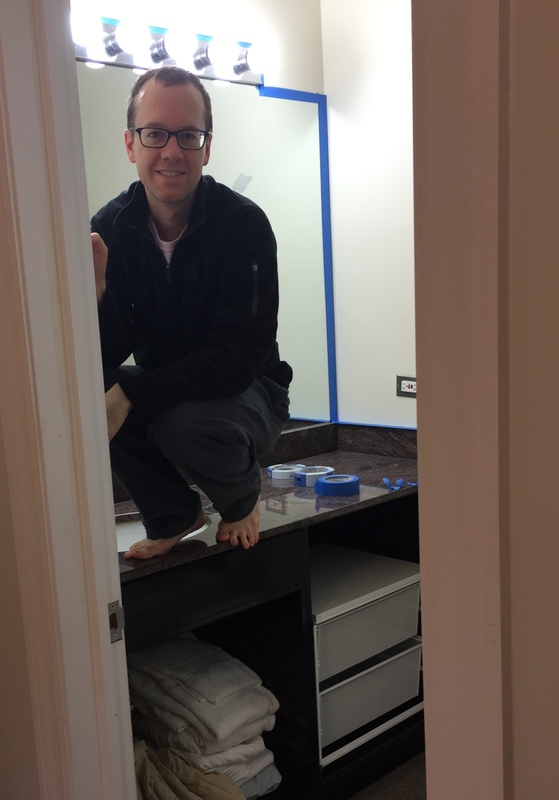 Eventually we’ll tackle the weird door-less vanity situation… Chicago has been brutally cold since the New Year, but we had a fairly mild holiday. Finally, on the very last day before returning to work it snowed several inches. 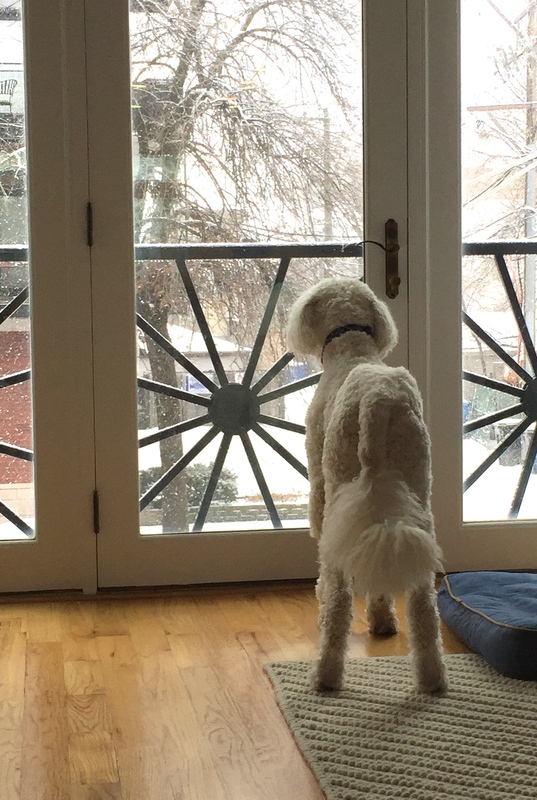 Here’s Remy watching the big flakes fall from the sky. I love this picture because it’s less than two weeks after his surgery and he was basically fully recovered by then. 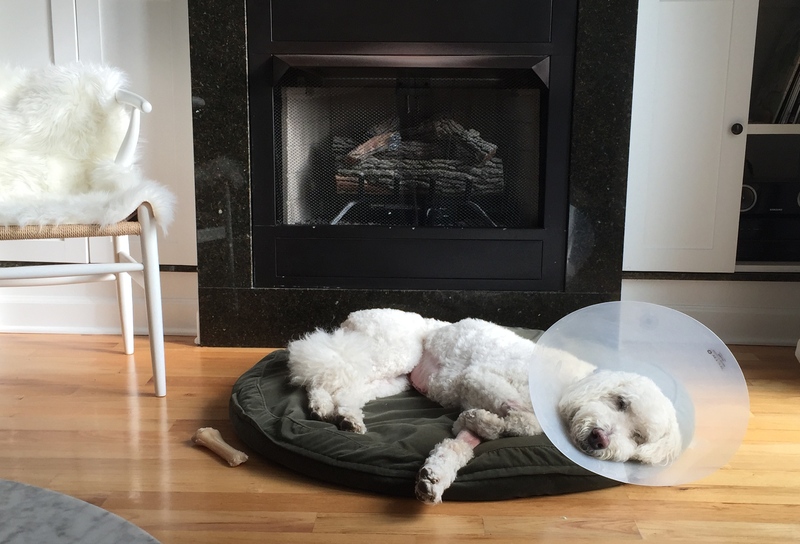 Dogs heal so quickly! A snowstorm and another day spent warm and cozy inside was the ideal way for our holiday to end. This entry was posted in Life, Pregnancy & Baby on January 14, 2015 by Paige Greenfield. Looks so wonderful! Perfect way to spend the holiday prepping for baby. Can’t wait to see the nursery! Also, thumbs up on getting a freezer. We did that this summer and I am so happy to have the extra storage. We also cloth diaper and we loooooove it! I don’t mind answering questions about any and all things baby/mama/dada 😊 It was very helpful for me to have several slightly more experienced mommies available for the laundry list of questions I had lol! Just send me a message 😊 We also mostly babywear which is clutch in NYC, but turned out to be a great thing for Arlo too, as babies love snuggles! !